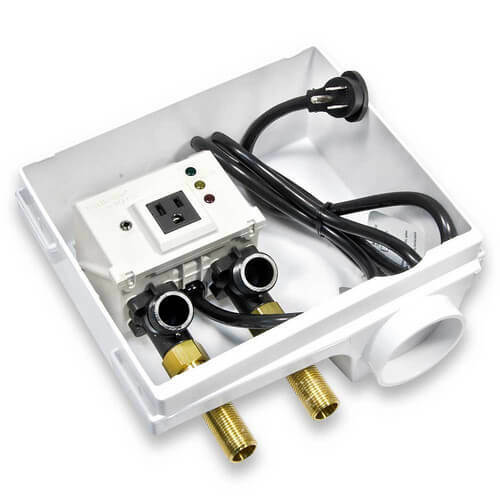 The Watts IntelliFlow® Automatic Washing Machine Shutoff Valve uses a state-of-the-art electronic control device that senses the washing machine current flow. When the washing machine is turned on, the controls detect the current flow to the washer, opening both hot and cold water inlet valves to allow water to flow to the washing machine. When the washing machine completes the full cycle the device senses the lack of current and closes the water inlet valves. These valves remain closed until the machine is used again. The IntelliFlow®'s automatic operation and floor mounted leak sensor protect against catastrophic water damage should a washing machine inlet hose burst while the machine is in use or unattended.